A bit of decadence and a lot of love rolled up in a perfect truffle package. Dark chocolate and rosewater pair perfectly together for a one of a kind treat. I'll be honest with you, when I got a package from Nielsen-Massey with lemon extract, almond extract and rose water I immediately had a thousand ways to use the lemon and almond extract in mind. I love Nielsen-Massey products and actual bought a whole quart of their vanilla bean paste because I loved it that much! The rose water, on the other hand I wasn't quite sure what to do with. That is, of course, the precise reason why I just knew I had to create something with that! When I think of roses, I think of Valentine's Day and when I think of Valentine's Day, I think of chocolate. So I figured why not make it all work together. Some dark chocolate, a bit of cream and just a hint of rose water would be the perfect romantic ending to any meal. 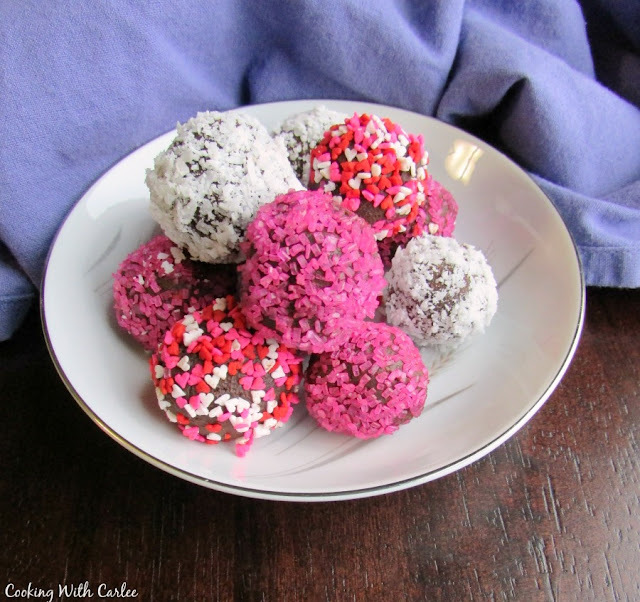 While Valentine's Day has certainly come and gone, these truffles would be just the thing to round out a nice brunch as well. The thing I love about using them as a brunch finale is that they aren't too sweet, just sweet enough. They also aren't too big, just big enough. As you bite into the cute little package, you definitely feel that creamy decadence right away. Something about a truffle just does that to you. And decadence and brunch are a bit of a match made in heaven. Then as you savor the chocolaty goodness you realize there is a bit of something unexpected there. Of course you curiosity leads you to take that next bite and let the chocolate melt slowly on your tongue. That thing you can't quite put your finger on is rose water. It's just a bit floral and pairs perfectly with the chocolate. I will warn you that a little bit of the rose water goes a long way and you want it to be a subtle addition to the chocolate that will leave them wanting more and not feeling like they "bit into an old lady at church" as my dad said when I might have possibly gone a smidge overboard on my first batch. Once I got the proportions in better control, this combination made for a really great treat. I hope you will give it a try! 1. 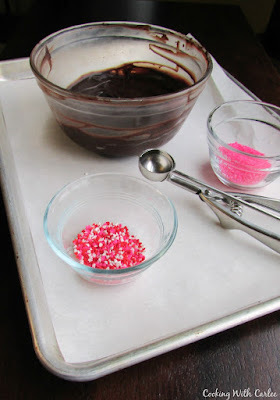 Chop chocolate and place in a medium bowl. Set aside. 2. In a small saucepan, bring cream to a low simmer. You do not want it to boil, just be plenty warm.3. Pour warm cream over chocolate and let sit for two minutes. 4. Stir until creamy and smooth. If the chocolate is not melted through enough, you can place the bowl in the microwave for 10 second bursts, stirring in between, until the chocolate is smooth.5. Stir in the rose water. Start with 1/2 tsp and add a bit more at a time until you reach your desired flavor.6. Refrigerate chocolate for at least 2 hours. Then scoop a rounded teaspoonful and roll between hands to form a ball. It is best if you work quickly. If the chocolate gets too soft to work with, return it to the refrigerator until chilled through again and then keep working. 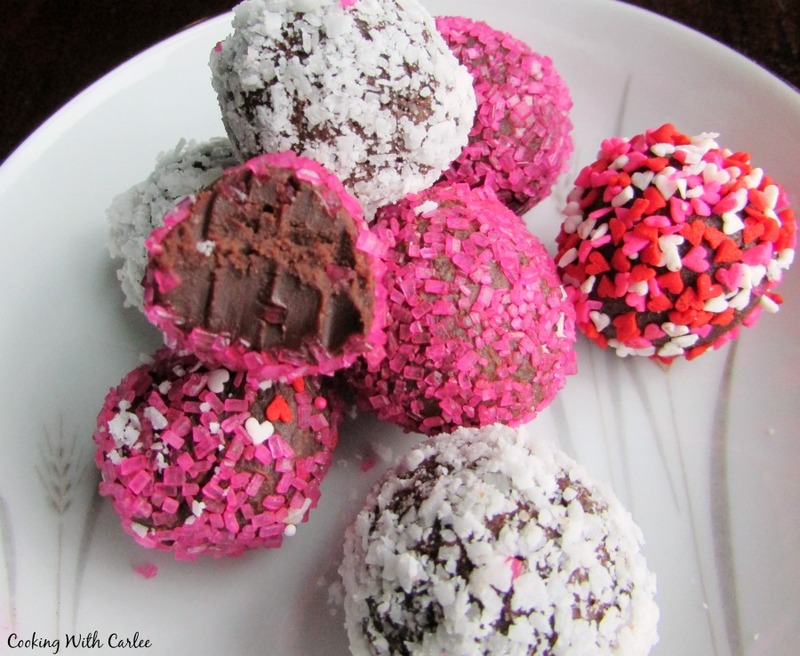 Roll balls into sprinkles and place back into the refrigerator to set if needed. 7. Store in an airtight container until ready to serve. These would get me in trouble, ha ha! I would be popping way too many of these babies in my mouth, they are so pretty and just scream eat me, I'm chocolatey delicious! My husband was eating them like 4 at a time! They are so easy to make too, which makes them doubly dangerous! These look lovely. How long do they keep for and do they need to be kept in the fridge? They can be stored in an airtight container in a cool place, but they do not need to be stored in the refrigerator. The experience of eating them is much better at room temperature. They keep for quite a while too. They should be fine for a few weeks. 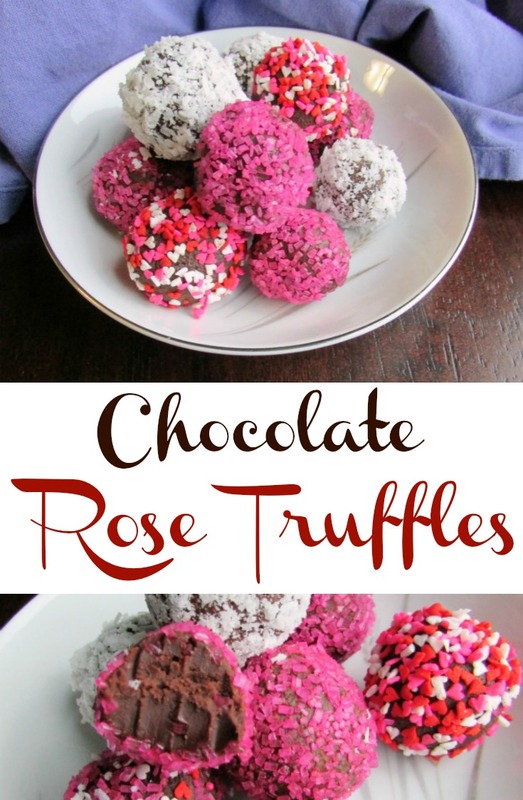 This chocolate-rose combination sounds perfect! Thank you! They really are great together! Your dad is so right....LOL... you need a very light hand with rosewater...just don't ask me how I know that because I can't come up with as clever a response as your dad. That first batch was definitely a little floral, but did get eaten anyway. Though they are much more enjoyable if you don't overdo it! The chocolate and rose really are a great combination! Guess who has a their first bottle ever of rose water just waiting for the perfect recipe to try it in?? I do! This is a great recipe for me to try out this rose water! Perfect timing! I can't wait to try it in more recipes, but these were a great start!